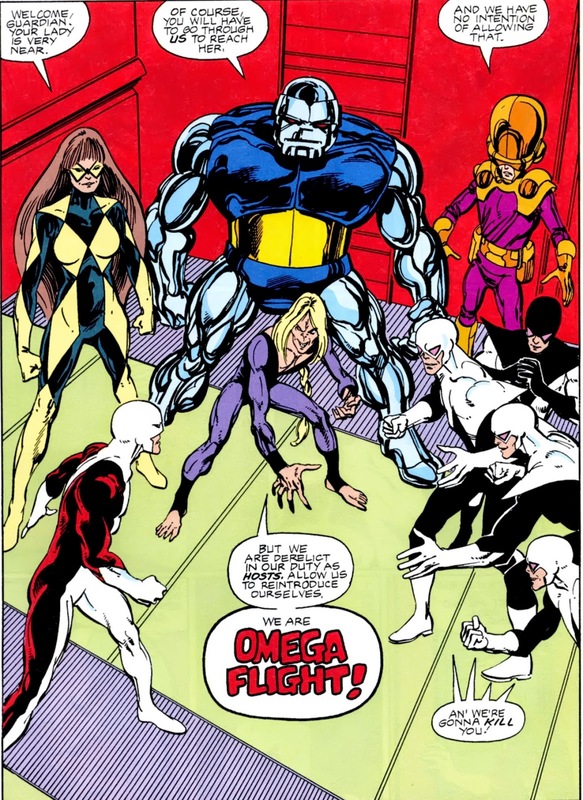 Marvel Comics of the 1980s: 1984: Alpha's Initial Outing part III: Oh my, Omega! 1984: Alpha's Initial Outing part III: Oh my, Omega! The year is still 1984 and John Byrne's about to finish the first twelve issues of Alpha Flight, a series he didn't particularly fancied working on from the word go. But that reluctancy led to an inspired level of daring creativity some would say bordered on carelessness, as we'll see in the third and final part of Alpha's Initial Outing. "Soon, these heroes will face their greatest challenge... One of them won't survive it." Back in 1984, before the age of online previews and spoilers galore, pretty much all you had to go by were Marvel's in house announcements, the "Bullpen Bulletins" which offered brief descriptions of upcoming events... and house ads like this one. For posterity's sake, it's almost a shame there weren't any message boards around then for fans to discuss which of the heroess would bite the bullet. Having Marrina there is a bit of a red herring (pun intended), considering the aquatic Alphan hadn't been seen since issue #4 when she quit the team to accompany Namor the Sub-Mariner back to Atlantis. But, as always, we're getting ahead of ourselves. There wouldn't be any dying Alpha Flighters until issue #12 and when we last left the team (that hadn't been together since #2) we were on the series' ninth issue which was part one of a Sasquatch two parter. Since we have a lot to get to, let's explain the plot of issue #9 with the recap provided in issue #10. "For it had never truly been the Thing at all. It had been..."
This brief summary really doesn't do issue #9 justice. 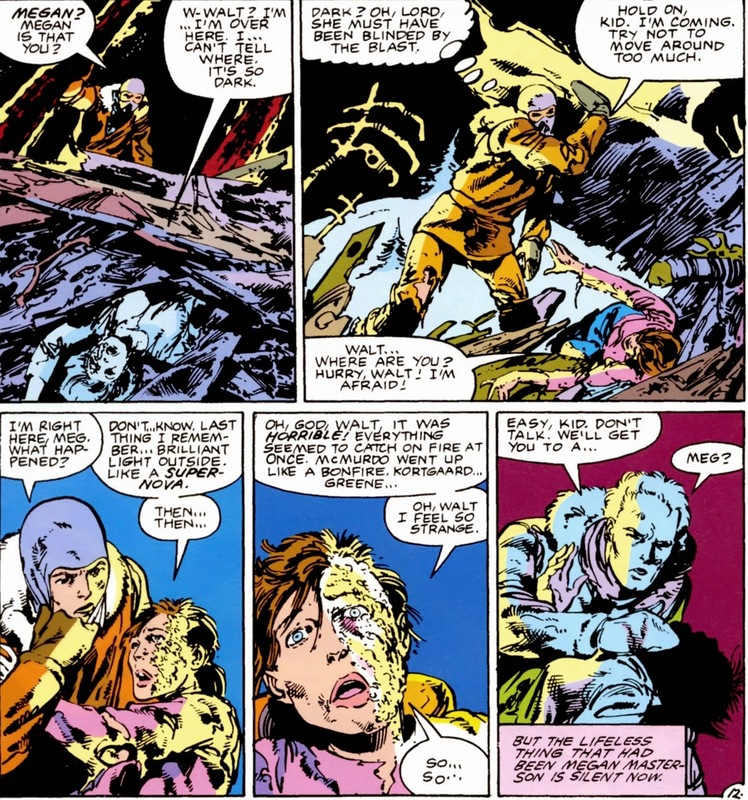 Byrne was going for an obvious hommage to the classic 1952 horror movie The Thing From Another World, based on a 1938 short story by John W. Campbell Jr. In it, researchers in a remote, arctic outpost encounter a supposedly deceased alien lifeform they take in to study, only to find it's still very much alive and out to make sure they aren't. all the powers of the Fantastic Four!" Or... perhaps he would. 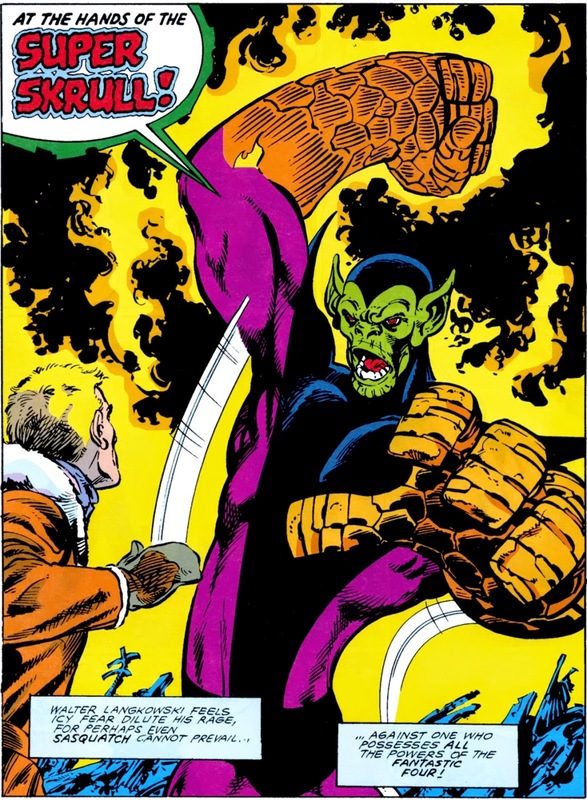 After an interesting and particularly brutal battle that showed Langkowski losing control over his monstrous form, the Super Skrull was teleported back to space. Which, essentially, meant a death sentence.
" His atoms are scattered back across the Van Allen belts, soaking up more radiation. he should last about five seconds before the cancer finishes him off"
That sequence, if nothing else, proved that Sasquatch wasn't too squeamish to send someone to his death... 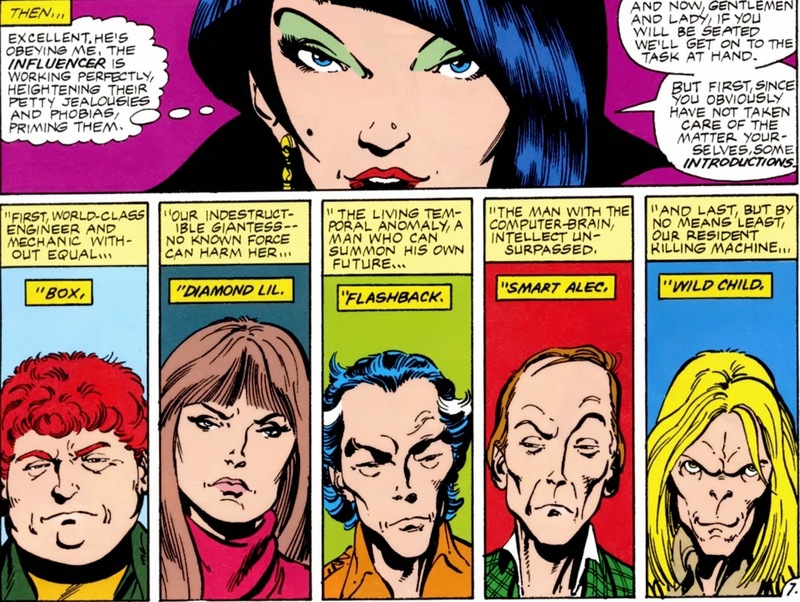 It's doubtful a member of the FF or Avengers would have dealt with their enemies, even if it was a Skrull who had murdered several innocent people. But, speaking of New York based heroes, guess where Alpha's leader Guardian is? "I had no idea I'd be moving here, leaving Canada, maybe forever"
Guardian, the leader of Canada's premiere team of superheroes has just moved to New York City. Long story short, in a continuing subplot the Roxxon oil company had offered James Hudson a lucrative position at their New York branch. 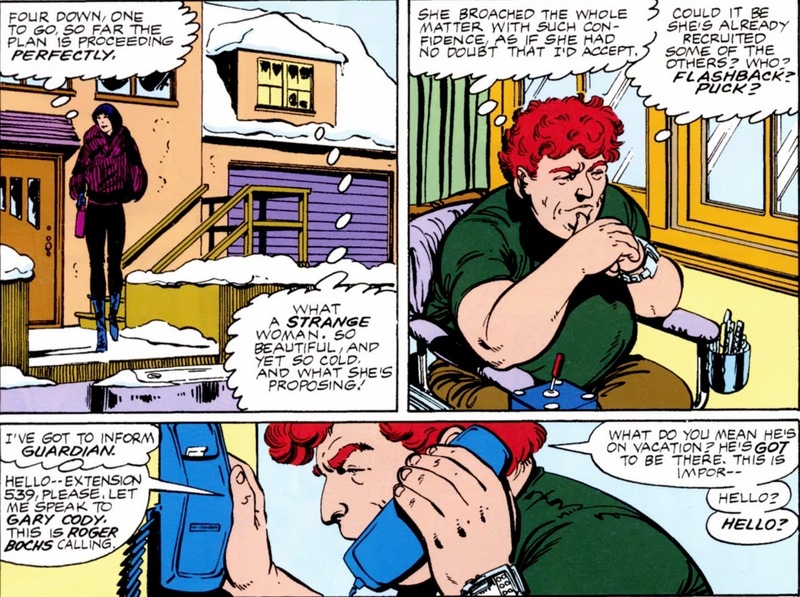 Seeing as he was effectively out of work since the Canadian government cut Alpha Flight's funding, he happily took the job and prepared to move to the States, along with his wife Heather. Unfortunately for Hudson, nothing was quite as it seemed. 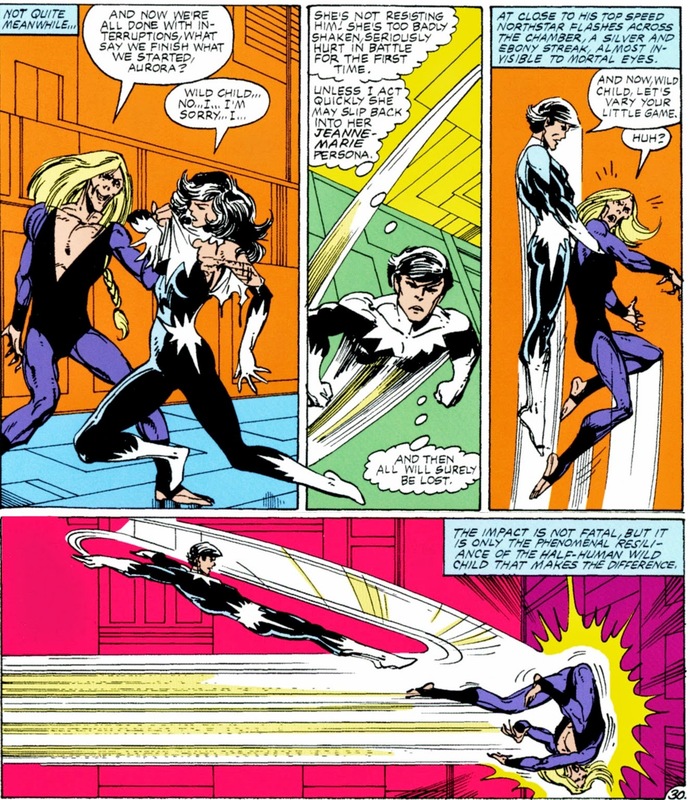 Alpha Flight I#11 really started to weave seemingly unconnected plot threads together into a neat little net the team would soon find themselves trapped in. Remember this lady from last post? "Four down, one to go. So far the plan is proceeding perfectly." Meet Delphine Courtney, a woman who's been visiting with and succesfully recruiting members of the Beta and Gamma Flight programs... Who all made their debut in a one panel flashback in Alpha Flight I#1. Courtney, using a mechanized form of mind control, all got them to come to New York. Surely, that can't be a coincidence? As far as delivering obviously necessary exposition goes, this isn't too bad... Even if it doesn't make any sense. Remember, they're all former Flight members, some of them were even on the same team. Unless they were all mindwiped during their exit interviews, I'm pretty sure they remember who they shared a locker room with. "My name is Jerome Jaxon. I propose nothing less than the utter destruction of Alpha Flight!" 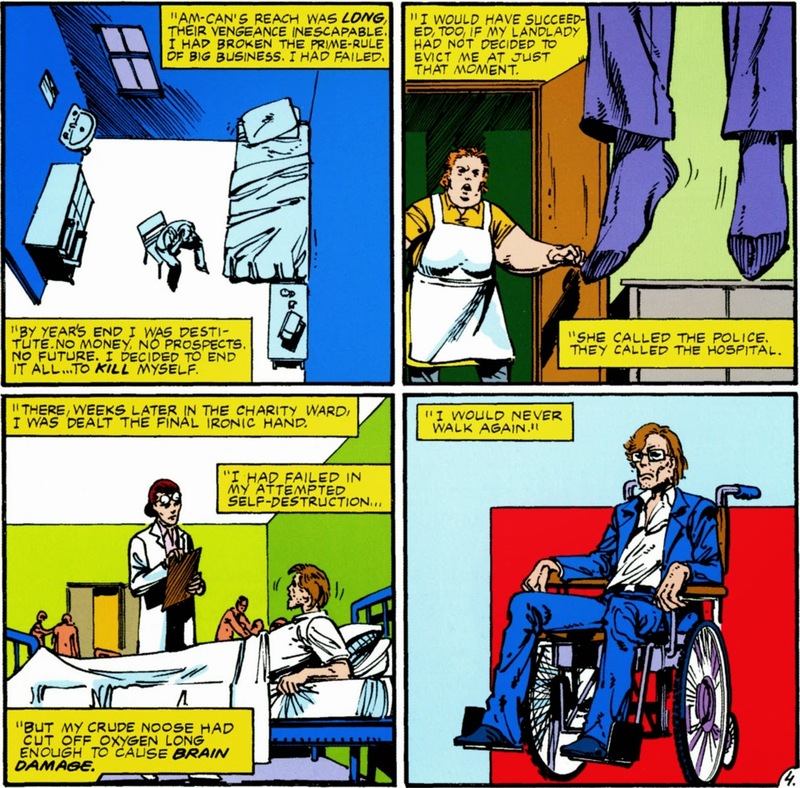 Ah, how to explain Jerome Jaxon... Apart from the fact his name alliterates in the mighty Marvel manner (Bruce Banner, Peter Parker, Otto Octavius, Doctor Doom etc), he's actually a bit of a sad sack. The reason why he hates Alpha Flight is James Hudson, who once worked for him as part of the research & development branch of Am-Can, a petrochemical company. There, Hudson came up with the prototype of the Guardian armor, which Jaxon realized could be used for more than coal mining: with some adjustments, it'd be a fantastic weapon of war. He planned to sell the design to the US military, only for Hudson to disable the one prototype that existed by stealing the psycho-cybernetic helmet required to operate it. The armor now useless, Am-Can fired Jaxon who grew bitter, desperate and despondent. "I had failed in my attempted self-destruction... but I would never walk again." 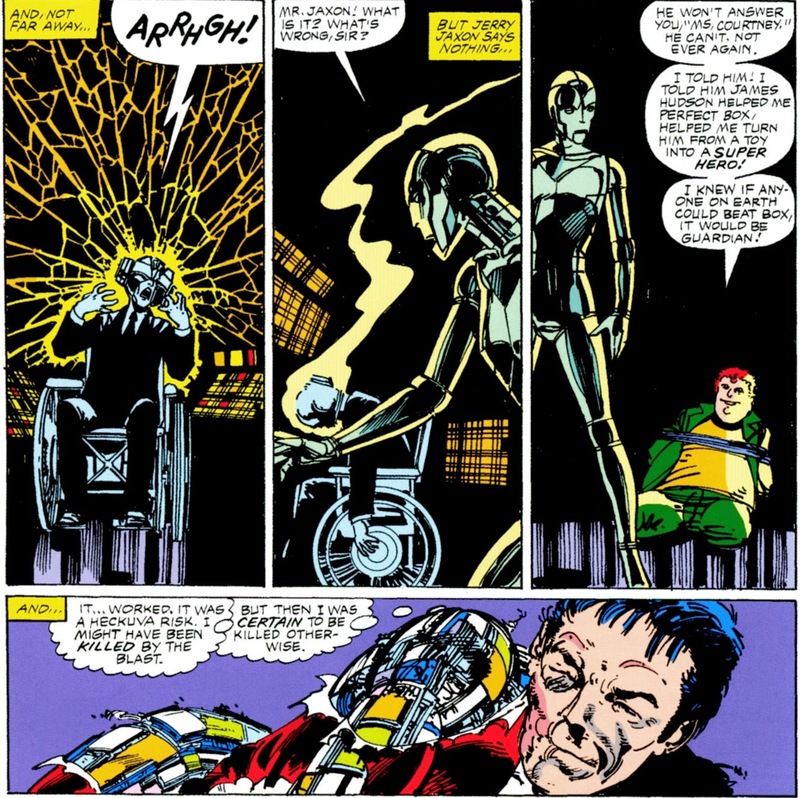 In 1984, depicting someone, even a supposed villain, attempting suicide was positively unprecedented. And, to add insult to injury, Jaxon failed and ended up paralyzed. A broken man, both in the literal and figurative sense of the word. However, when he inadvertently figured out that Canada's national hero was actually his archenemy James Hudson, he regained his purpose in life. 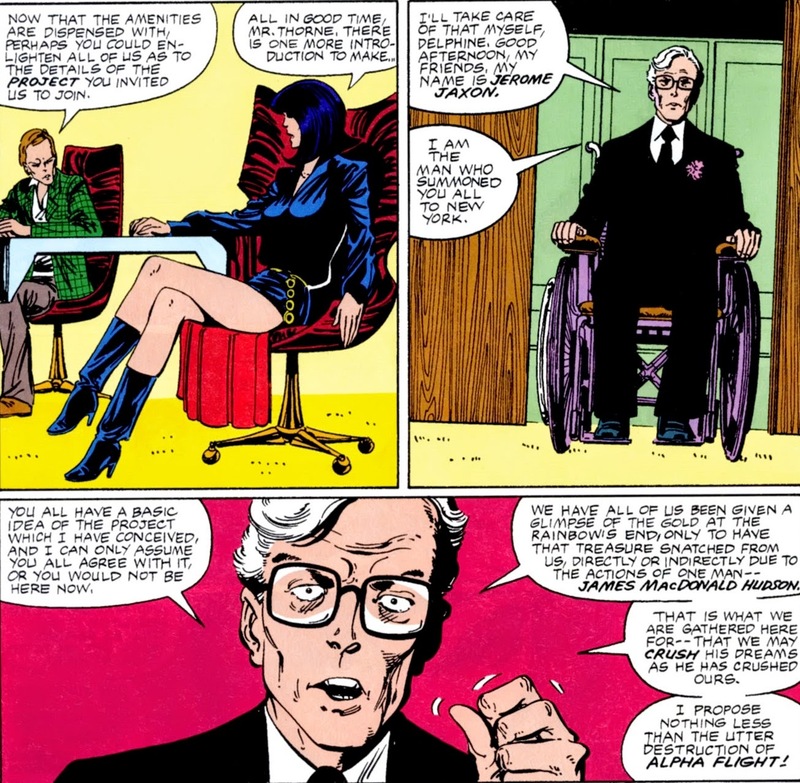 Jaxon went to Am-Can's business rival Roxxon with this knowledge and the company was more than a little interested. They partnered him with Delphine Courtney and together, they worked out the plan to lure Hudson to New York for vengeance (and, one would assume, to get their hands on his armor). Having that vengeance carried out by former members of Beta and Gamma Flight, influenced by Courtney's devices to be out for blood, was poetic justice. But how to get your hands on Guardian? Simple, capture his wife and tell him about it. I am holding her in an office on the 43rd floor of Number One World Trade Center." Sigh, the 1980s... back when seeing a flying object hurtling towards the WTC wouldn't cause readers' stomachs to turn (or internet fora to flare up). 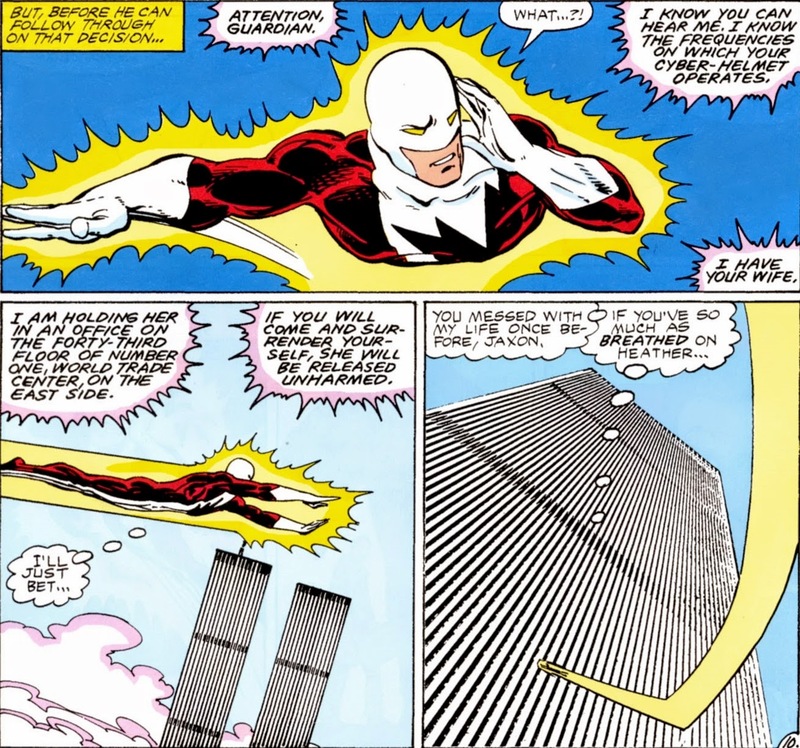 Inside the World Trade Center, Guardian discovered who was waiting for him in the closing pages of #11. "Allow us to reintroduce ourselves. True to stereotype, even Canadian supervillains are so polite they take the time for proper introductions before trying to kill you. And with that, the setup for the year's capper was obvious. Alpha's instigator versus those he had allegedly scorned. So, where's the backup, where's Alpha Flight? Well, he sent an emergency signal back in #11, a call the membership received an issue later through their implanted communication chips. The only one to miss it was Marrina, who didn't have an implant but a hanger she wasn't wearing when the call came in. "As soon as I uproot this makeshift hockey-stick..."
Way to emphasize the fact they're Canadian, eh? Shaman used a little magic to break up the fight and then used a whole lot more to teleport the team to Guardian who was more than a bit relieved to get some reinforcements. It was Alpha versus Omega in a confrontation far more vicious and cruel than most superhero dust ups of the time. People were out for blood and pulled no punches. 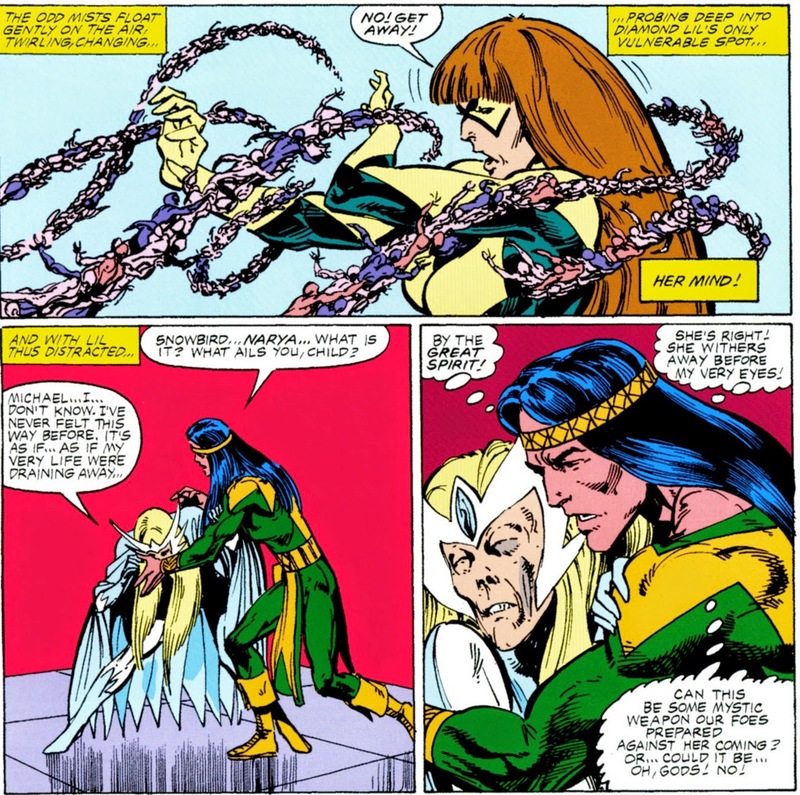 Wildchild savagely tore into Aurora, forcing Northstar to resort to extreme measures. of the half-human Wild Child that makes the difference"
"She withers away before my very eyes!" So, what's wrong with Narya? Well, remember how Shaman assisted in Snowbird's birth? He used his powers to anchor the god-child to this reality, by literally binding her life force to Canada. As we find out now, this also means that as soon as she leaves her native soil, she'll die a painful death. An interesting reveal to say the least, though a little surprising given the fact she left Canada before without any visible discomfort... like when she attended the Hulk's big parade in New York City after the president pardoned him in Incredible Hulk I#279. How to explain this one? Well, it's hardly No Prize worthy, but let's just say the reason she looked okay here was because she didn't have to rapidly expend her energies in a fight to the death. Yeah, that'll work, true believers. Also: apparently Sasquatch didn't have time to shave. for an instant, Smart Alec knows why." "I might have been killed by the blast. But then, I was certain to be killed otherwise." Oh James, you don't know the half of it... Defeating Box by creating an overload that fried Jaxon's mind also caused his suit's power pack to overheat. Guardian only had a few seconds to safely remove it in a now classic, often imitated sequence. "5, 4, 3, 2, 1..."
"I wonder what's behind this door." Faster than one can say "flame on! ", Guardian is seemingly incinerated before his wife's eyes... And while Heather watches Mac get burned to a crisp, she realizes that it's all on her. If only she hadn't distracted him at the most crucial of moments. And with that, Alpha Flight's first year as a team comes to an end... And what an illustrious first year it was. As if getting fired by the government in their premiere issue wasn't bad enough, the second featured their new member Marrina going crazy, mutilating a midget before storming off to fulfill her destiny: breeding a race of alien invaders. Issues 3 and 4 saw part of the team chasing the murderous Marrina, leading to an encounter with the Master of the World, which they only survived because of the Sub-Mariner and the Invisible Woman... Whose competency made Alpha look like inconsequential guest stars in their own book. "The lifeless thing that had been Megan Masterson is silent now"
But that all led to #11 & 12, the big finale which reunited the team to save a leader who had actually pretty much abandoned them by taking a job in another country... A leader who'd be dead by the end of #12 anyway. All in all not the most memorable of beginnings for a superhero team. Alpha Flight makes the original Defenders look calm, cool and stable... and their founders include Namor "breathing oxygen makes me go crazy" the Sub-Mariner, a silvery alien on a surfboard whose previous job was picking out planets for lunch and the friggin' Hulk. 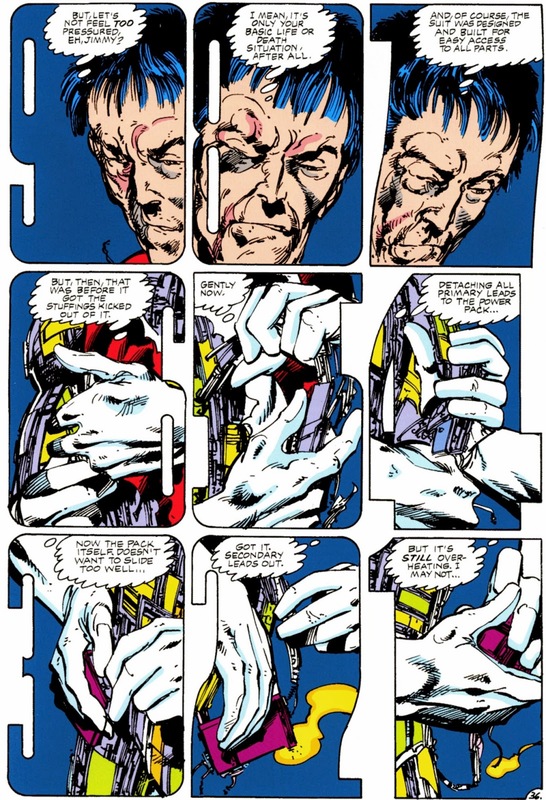 As stated before, Byrne had trouble figuring out what to do with "his" creations. "Alpha Flight was never much fun. The characters were created merely to survive a fight with the X-Men, and I never thought about them having their own title. 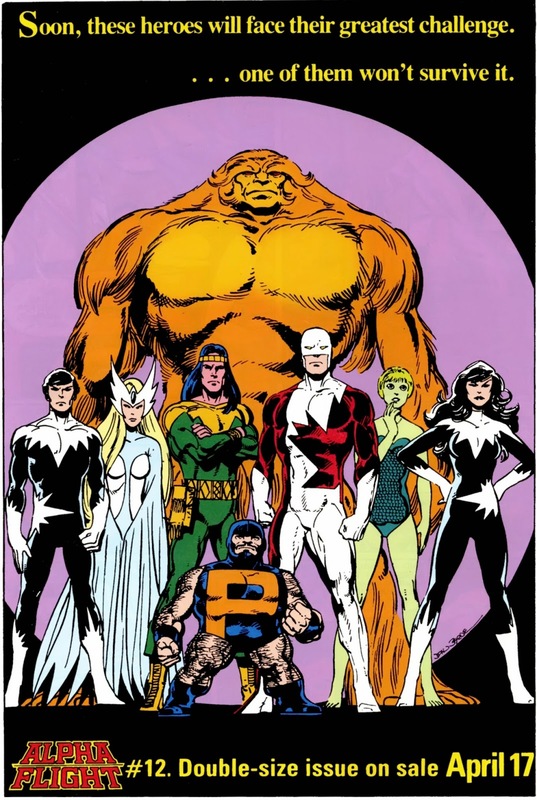 When Marvel finally cajoled me into doing Alpha Flight, I realized how incredibly two-dimensional they were, and spend some twenty-eight issues trying to find ways to correct this fault. Nothing really sang for me. If I have any regrets, it would probably be that I did the book at all! It was not a good time for me." Still, he tried and his second year on the book proved distinctly different than the first. A new leader, new members and the sense the team was actually, well, a team. 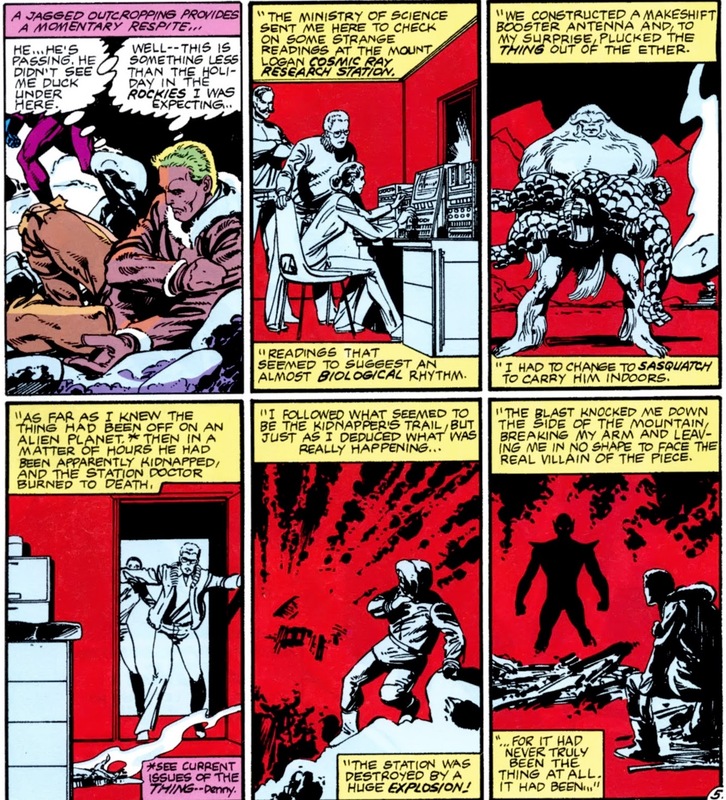 Byrne tried it all in an anything-but-the-kitchen-sink approach to storytelling just to keep himself amused. 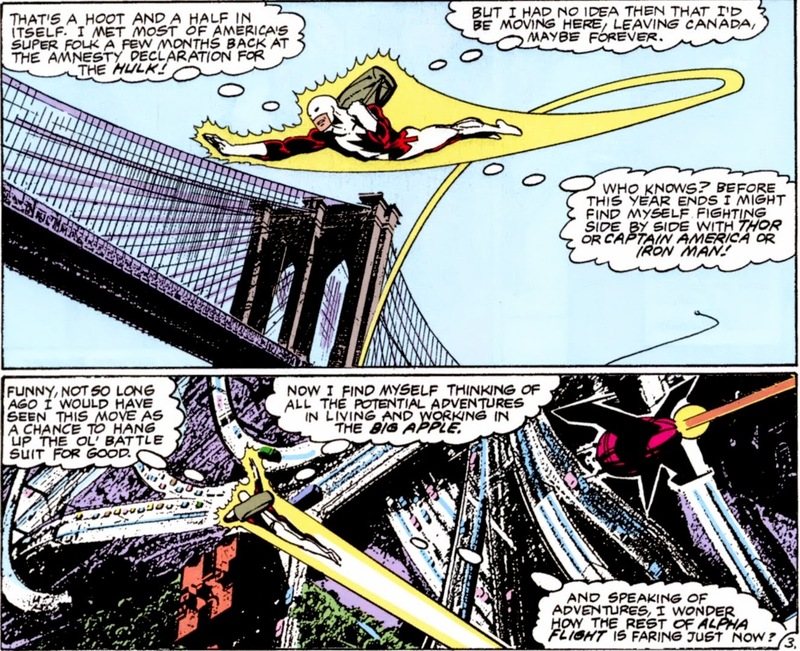 And he got away with most of this, one because's John Byrne and second because Alpha Flight wasn't exactly a household name... Not even in the house of ideas. This gave him ample opportunity to experiment and be as gross, creepy and weird as he wished. 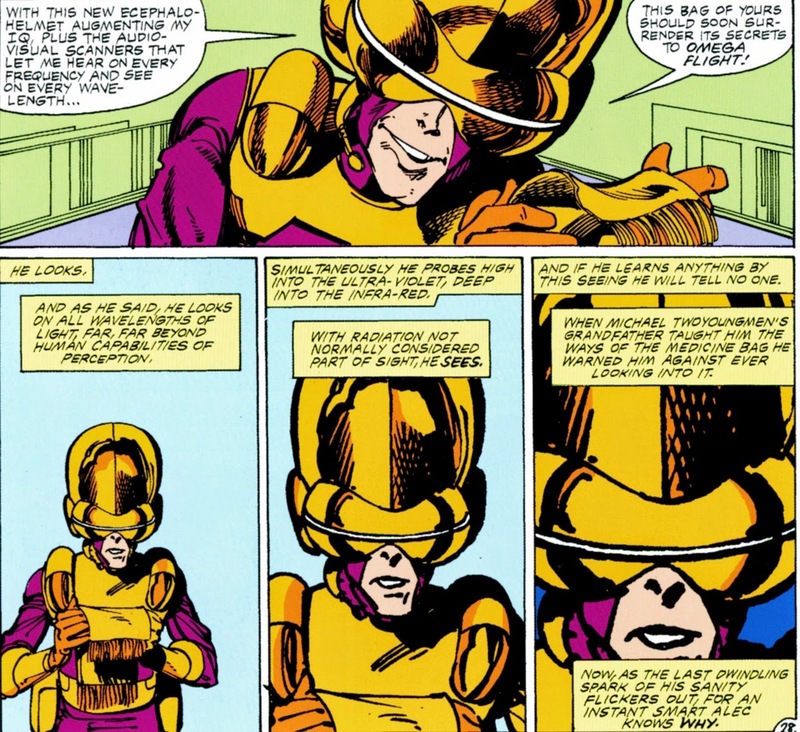 If nothing else, it gave us Marvel mainstays like Pink Pearl and Gilded Lily. 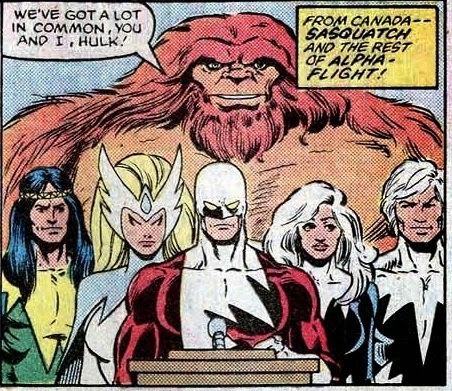 Maybe someday we'll revisit Alpha Flight year two. If you can't wait, by all means track down those issues... Marvel released the Byrne run in paperback back in 2011 and they're well worth getting: restored art printed on high quality paper with brighter than life colors... As the images in this overview prove, they really add to the experience. All things considered: even though 'Alpha' never gave John Byrne any flights of fancy, the Canucks never soared higher than with him at the helm. Which, if you think about it, really says something, eh? Great overview and a pleasure to read. FWIW, Byrne's lack of empathy for this title translated into some interesting, unpredictable issues. It's too bad he seemingly doesn't take pride in having pushed the boundaries of traditional comic book storytelling... throw-away characters or not. Guardian's death was a much discussed topic among friends due to his grisly demise and the fact that - as far as I know - he remained dead... especially given his status as AF's supposed team leader, Hudson's demise was quite an anti-establishment statement (at the time, anyway). I was surprised and gratified to see Byrne get away with cleanly disposing of this minor facet of Marvel's intellectual property. It certainly makes my recollection of his run on the series all the more memorable. Also enjoyed this greatly. #12 was a great issue. Besides the dramatic death, it also gave us a chance to (finally) see the full team in a brawl that hearkened back to the old X-Men fights. 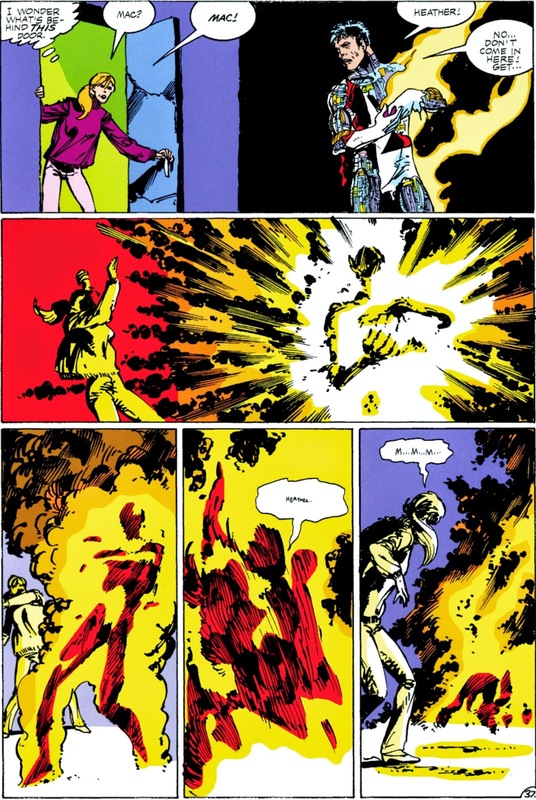 Byrne really choreographed the battle nicely, with some very original twists and outcomes, I thought. I confess I'm disappointed we won't see a similar analysis of Year 2. 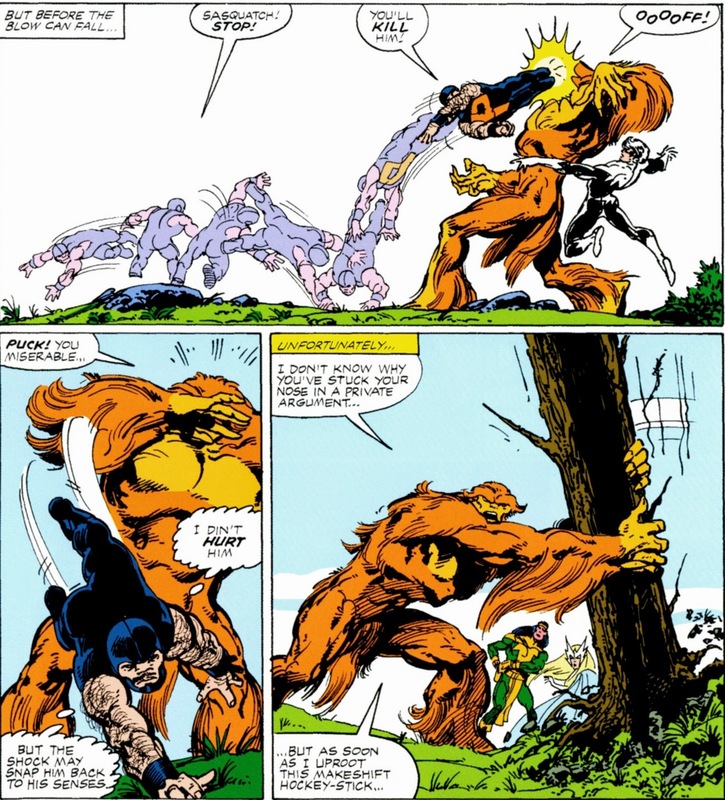 That also ended with a very cool double-sized finale, prefaced by the shocking issue 23. I remember the big twist in that blowing me away as a kid (I'm being deliberately vague here). Especially since we'd had two status quo changes telegraphed by a house ad (Guardian's death and a new team leader), so to have another sudden change happen suddenly and unannounced made it very memorable, for me anyway. It speaks to the above posters remarks on how Byrne was able to really play around and take chances, and this resulted in a very fun ride. Thanks again for the great write-up. Those first 12 issues are among my favorite comics ever. Don't really care what Byrne thinks of them: AF was a dozen times more interesting than his Fantastic 4.